The Wawona Hotel (main building), Yosemite NP, 1985. The Wawona Hotel is a complex of seven structures built on the upper edge of a large meadow in the southwestern corner of Yosemite National Park. The buildings are laid out in a relatively formal pattern on the edge of a rolling hill overlooking the meadow. The front elevation of the main hotel building runs north-south. A circular drive with a centered fountain leads up to the hotel. The exterior walls of the structures, to the northwest, east, south, and southwest of the main hotel building, are all aligned with the cardinal directions, contributing to a Victorian formality. The area of Wawona, an Indian term for "Big Trees," became part of Yosemite National Park in 1932. The buildings were constructed over several decades, beginning as a development at a stage stop on a passenger and freight line. The first building of the present development to be constructed was "Long White" or Clark Cottage built in 1876. A fire in 1878 destroyed the rest of the original stage stop buildings, but Long White remained and became the anchor for the new Wawona Hotel group. The main hotel building opened in 1879. The "Little White" or manager's residence was complete in 1884. Landscape painter Thomas Hill's studio was finished in 1886 adjacent to the main hotel structure. The "Little Brown" or Moore cottage took its place east of the main hotel building in 1894. The "Long Brown or Washburn cottage may have been completed in 1899, although the exact date of its construction remains open to question. The Annex was completed in 1918. Three more buildings were constructed to augment hotel facilities (including a store and an employee dormitory) in 1920, but none is extant today. The buildings of the hotel complex have a number of features in common. They are all of wood-frame construction with painted exterior finishes. They are all more than one story in height with multiple exterior porches or verandas and some decorative woodwork. All have undergone certain changes in recent years to improve the quality of the seasonally-offered guest services and to make the structures safer for occupancy. Cosmetic finishes such as paint, wallpaper, and carpeting over the original floor materials, have all been updated. Most of the bathrooms have new fixtures. Sprinkler systems and baseboard heaters have been added. New shakes were put on the roofs in recent years. Many of the furnishings throughout the hotel are period pieces but are not original to the structures. These period pieces are not included in this landmark nomination. Any original remaining furniture, light fixtures, or paintings are included. The Long White or Clark Cottage, completed in 1876, is a wood building with a balloon frame. The one-and-one-half-story building, rectangular in plan, has an exterior siding of weatherboards finished at the corners with cornerboards. The gable roof and multiple dormers are finished with wood shakes. The veranda surrounding the building is sheltered by a skirt roof supported by chamfered posts with curvilinear brackets. A railing with diagonal cross pieces encircles the veranda. The railing and the detailing of the eaves' woodwork are elements of a simplified Greek Revival architecture. Most of the windows in the building are six-over-six double hung. The south gable end of the building contains a small shed, constructed between 1890 and 1917 by which time all of the dormers were added. All of the eight guest rooms contain baths, added during the 1940s by decreasing the numbers of original guest rooms. The interiors may contain the original painted ceilings. Room configuration dates from the 1940s; sheetrock covering the 1940s wall partitions dates from the early 1980s. For these reasons only the building's exterior, first-floor ceiling, and 1940s room configuration are included in this nomination. The main building of the Wawona Hotel (1879) is a balloon-frame structure generally T-shaped in plan. The foundation is stone and wooden piers, hidden by a latticework skirt that is in turn covered with vines. Exterior walls are drop-channel siding. A two-story veranda encircles much of the building. The veranda's railing is in a simple geometric pattern of rectangles. The building is sheltered by a hip roof, and a skirt roof wrapping around the building covers the veranda. All of the roofs are finished with wood shakes. An addition at the north end of the building, dating from 1914, contains much of the present dining room and kitchen space. That addition changed the building's plan from an "L" to a "T." The present lobby and expanded dining room date from 1917-1918, when the building's interior was remodelled. The lounge and sitting room south of the lobby also date from that time, as does the lobby configuration with the small office behind the registration desk. The upstairs contains dormitory space for hotel employees. The tall windows in the building are principally four-over-four double hung. The four-panel wood doors that lead out to the veranda have transom lights above. These original doors retain their hardware and have new locks for improved security. The front of the hotel is nearly symmetrical. The main entrance to the hotel is through french doors near the central portion of the veranda. Above the entrance is a fourteen-light fixed transom. The lobby, with its 1917 light fixtures, is a central space with two sitting rooms and guest rooms to the south, and the dining room and small bar to the north. A small staircase to the right of the registration desk has a decorative balustrade and leads upstairs to the dormitory space. French doors lead out from the lobby to a porch at the rear of the building. The sitting rooms contain fireplaces. Windows and interior doors are surrounded by heavy wood moldings, and picture moldings wrap around the upper walls of the rooms. The dining room and bar have hardwood floors. Box beams in the dining room give the ceiling a coffered effect. The lighting fixtures hanging from the ceiling have Giant Sequoia cones woven into their suspending chains and as a decorative fringe around their shades to bring to mind the grove of Big Trees two miles away. The manager's residence, now known as Little White and completed in 1884, is a small L-shaped building with intersecting gable roofs. The veranda that wraps around the building is sheltered by a skirt roof. All of the roofs are finished with wood shakes. The railing around the veranda is simple and consists of two parallel boards connecting the chamfered posts. The windows are four-over-four double hung. The original four-panel doors and their hardware remain, again augmented by new locks. The interior of the building has undergone some renovation. The kitchen of the manager s residence is now bathrooms for the guest rooms. Baseboard heat warms the rooms. At some time in recent years the sprinkler system was added. The building retains its original high ceilings and wood moldings. The Hill Studio (probably 1886) to the northwest of the main hotel building is a one-story building with a cruciform plan. Originally built as a painting studio and sales room for landscape painter Thomas Hill, the building saw a variety of uses since his death in 1908 including ice-cream parlor, dance hall, and recreation room. These changing uses resulted in changes to some of the original fabric. Most of these changes were reversed when the building underwent a partial restoration in 1967. Other changes, such as the restoration of the skylight, are scheduled for completion soon. The present roofline of the shake roof presents a steeper pitch than the original standing-seam metal roof. A small balustrade mimicking a widow's walk tops the building. The porch on the front elevation is sheltered by a skirt roof. Details of the picket-type porch railing and spindly upper brackets are reminiscent of a perpendicular Eastlake style. The building's foundation is hidden by a skirt of beaded siding. Exterior walls are drop-channel and beaded siding. A four-panel door is centered on the front elevation. On the interior, ceilings are beaded siding and floors are hardwood. A painted wood wainscot encircles the walls. The wood doors, all surrounded by moldings, have four panels. An exterior elevator has been constructed at the rear of the building adjacent to the back porch steps. It is not attached to any historic fabric. The base of a circular fountain directly in front of the main entrance dates from the nineteenth century. Intrusion alarms and a halon fire suppression system have been installed in the building. The Little Brown Cottage (1896), also known as the Moore Cottage, sits picturesquely above the main hotel building on a little knoll. The building is nearly square in plan, with a small shed- roofed addition on the east. The hip roof is pierced by dormers on the north and south and topped with a cupola with Palladian windows looking out in the four cardinal directions. The gable ends of the dormers are filled with diamond-pattern shingles. The cornerboards of the cupola are small pilasters. The veranda surrounding the building has a skirt roof that tucks up under the bracketed eaves of the main roof. Decorative "gingerbread"-type brackets at the tops of the chamfered posts and the railings between the posts add an elegance to the structure that is repeated in the sawn bargeboards in the dormers. Exterior walls are drop-channel siding with cornerboards finishing the edges. The tall windows of the first floor are one-over-one double hung. The building's foundation is screened by a skirting of beaded siding. The original high ceilings on the first floor of this structure remain. Original four-panel doors and their hardware are also intact. Upstairs wood moldings with bullseye corner panels surround the door openings. The building has undergone the usual cosmetic and safety updates. The hardware on the original four- panel doors has been restored. New wallpaper in a tasteful period design now covers the walls up as far as the picture molding, and carpeting covers the original wood floors. The remodelled bathrooms contain principally new fixtures, although the sinks may be original. The Long Brown or Washburn Cottage was probably constructed in 1899-1900, although an exact date is lacking. The large wood- frame building is two-and-one-half stories in height, and generally rectangular in plan. The structure originally looked similar to the Clark Cottage--a long, rectangular one-and-one- half-story building. The second story and present attic were added in 1914 and the hipped-roof addition at the south sometime between 1914 and 1932. A veranda wrapping around most of the building's first floor has detailing similar to that on the Moore Cottage. The chamfered posts have jigsawn railings and the same bracket gingerbread of double-scrolls and diamond patterns. A skirt roof covers the veranda. The main gable roof of the building runs north-south. Paired eave brackets and bargeboards are similar to the Moore Cottage. These eaves on the gable ends have cornice returns, a detail typical of Greek Revival buildings. Vent openings in the gable ends are pointed, paralleling the shape of the gable. Roofs are finished with wood shakes. Windows are one-over-one double hung. The exterior is sheathed with drop-channel siding edged with cornerboards. The foundation is screened by a vented skirting of horizontal siding. A staircase and additional balustrade were added on the north end of the building in 1951 to serve as a fire escape. Additional windows were added to the structure at the same time when the interiors were remodelled. The Annex, constructed in 1917-18, is a two-and-one-half-story building with a partial basement at the west end. The large wood-frame structure is rectangular in plan and surrounded by a two-story veranda. The balustrades edging the verandas are simply patterned vertical balusters with horizontal rails. Porch posts have T-shaped diagonal brackets giving a Stick-Style appearance to the building. The gable roof and skirt roofs around the gable ends are finished with wood shakes. Exterior walls are finished with wood shingles painted white. The foundation is screened by a latticework on the north and central portions of the building. The basement area at the south end is sheathed with wood shingles. Most of the building's double-hung windows are paired, as are the doors entering the guest rooms from the verandas. Double sets of french doors on the south and north gable ends provide access to those areas of the building. The large room at the west end is a common space with a large stone fireplace, wood panelling, and decorative ceiling moldings. The building has changed little since construction. The fountain and reflecting pool in front of the main hotel building, finished in 1918, are on the original location of a first fountain existing prior to 1899. The fountain is circular in plan with a cube-shaped architectural form on top with four of its sides pierced by arched openings. The fountain is made of river cobbles like those that line the entrance drive. Although the architecture of the individual buildings is not extremely noteworthy--buildings such as these were derived from the mainstreams of contemporary architecture--the integrity of the hotel complex is unusual. Constructed over a forty-year period, the buildings have an architectural unity established by their formal placement on the rural landscape, by the principal building material, and by their form and massing. The porches and verandas around the rectangular buildings are a common feature that further unite the structures and encourage an airy connection with the landscape. The variety of often subtle stylistic elements livens the architectural unity. The buildings contain elements taken from the Greek Revival style, such as the cornice returns on the eaves of the Washburn Cottage. Stick- Style and Eastlake details appear in railings and brackets. Even Palladio's classical elements appear in the cupola of the Moore Cottage. The simple structures and their specific details illustrate a broad spectrum of stylistic concerns present in American architecture from the 1870s through World War I. The hotel complex contains additional aspects of architectural significance. The hotel retains integrity of function by providing the same visitor service it has for more than 100 years. The complex is still frequented by travelers visiting the region seeking a quieter, more subdued atmosphere than the Yosemite Valley. The buildings retain considerable architectural integrity, particularly on the exteriors where nearly all of the buildings' exterior fabric pre-dates World War I. This unusual combination of intact complex and functional integrity is particularly noteworthy. Wawona Hotel's regional significance in the area of commerce is based on its resort history as a major California hotel catering to Californians, other Americans, and foreign tourists for more than a century. Famous visitors to the hotel include former presidents Ulysses S. Grant and Rutherford B. Hayes, President Theodore Roosevelt, and presidential candidate William Jennings Bryan. The hotel is of local significance in the areas of exploration and settlement, and conservation because it was constructed on the homestead of one of Yosemite's earliest settlers, Galen Clark, appointed the first official protector of Yosemite as a state park. The hotel is of regional historical significance in the area of transportation as the stage station adjacent to an important river crossing on the south fork of the Merced and along a pioneering stage route. The complex is of national significance in art because it contains the Thomas Hill studio, also known as the Pavilion, where landscape painter Thomas Hill worked in the summers between 1886 and his death in 1908. Hill, considered one of the last painters of the Hudson River School, had an earlier studio in Yosemite Valley. 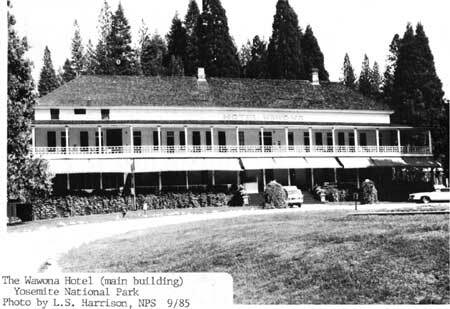 John Washburn, owner and builder of the Wawona Hotel, was courting one of Hill's daughters at the time that Hill moved his operations out of the Valley. Washburn constructed the studio for Hill's use and undoubtedly with some personal goals in mind. A working studio and sales area of a famous artist attracted more visitors to his hotel and showed a strong commitment to the family of his future wife. The Wawona Hotel's atmosphere as a rural, Late Victorian resort remains. From simplest beginnings as a homestead and stage stop in the 1850s, the development blossomed into a resort with perpendicular axes, centered fountains, and the grassy plazas with a Victorian sense of formality. This formality, also evident in the relative symmetry of the architecture, is characteristic of the time. The Wawona 's integrity of exterior architectural design and of function as a Victorian resort in continuous operation for more than 10 years are unique in a national park. 1 These areas of significance are summarized here briefly in the text. Detailed explanations are in the National Register form prepared by NPS western regional historian Gordon Chappell in 1975. Crosby, Anthony, and Nicholas Scrattish. Historic Structure Report: Wawona Hotel Yosemite National Park, California. Denver: National Park Service, Denver Service Center, 1983. National Park Service files including List of Classified Structures and National Register files, Western Regional Office. Sargent, Shirley. Yosemite's Historic Wawona. Yosemite, California: Flying Spur Press, 1984. The boundary as shown on the enclosed sketch map (omitted from on-line edition) begins at point A on the west corner of the intersection of Highway 41 and the service road, then proceeds approximately 700' in a northerly direction along that same western edge of the service road to point B along the same road 20' from the north corner of the Moore Cottage, then proceeds 250' due north to point C, then 450' due east to point D, then 350' southwest to Highway 41 to point E, then following the northern edge of the highway to point A.